With your Azure free account, you get all of this – and you won’t be charged until you choose to upgrade. Use Azure Virtual Machines, Managed Disks and SQL databases while providing high availability and network performance with Load Balancer. 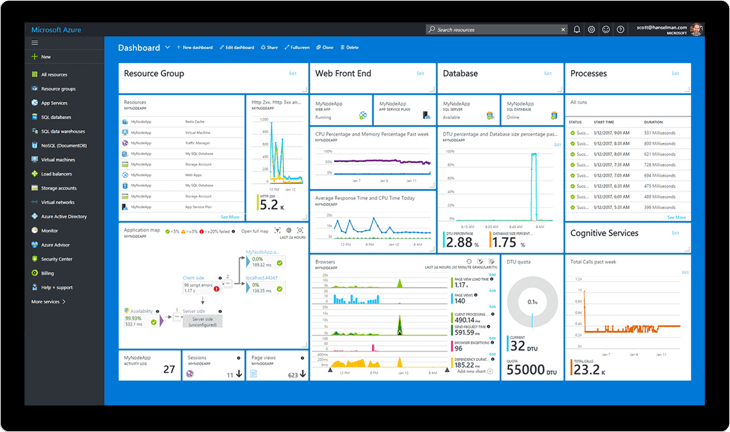 Build based on your customers’ interests and behaviour using App Service and Azure Cosmos DB, Xamarin, HockeyApp and Traffic Manager. Make better decisions and create finer experiences using Machine Learning, Data Lake Analytics and HDInsight. Create an SQL database that delivers intelligence built in. Transfer data inbound and outbound through our robust network of global data centres. Quickly create powerful apps for any platform or device using your choice of tools, including Node.js and PHP. Enable natural and contextual interaction with tools that augment users’ experiences. Build apps in any language using our DevOps service – Git repos, CI/CD, build and release automation. Send push notifications to any platform from any back-end. Provision private networks and connect to on-premises data centres. Build, test and demonstrate applications in a non-production environment. No. Starting is free, plus you get a $200 credit to spend in the first 30 days. You won’t be charged – even if you start using services – until you choose to upgrade. You can upgrade to a pay-as-you-go subscription to get continued access to free products – some for the first 12 months, and others that are always free. For 12 months after you upgrade to a pay-as-you-go subscription, certain amounts of popular products are free. After 12 months, you'll be billed for these products at the pay-as-you-go rates. A phone number, a credit or debit card and a Microsoft Account username. We use the phone number and credit card for identity verification. We won’t charge your credit card anything, but you may see a one-dollar verification hold on your credit card account, which will be removed within three to five days.